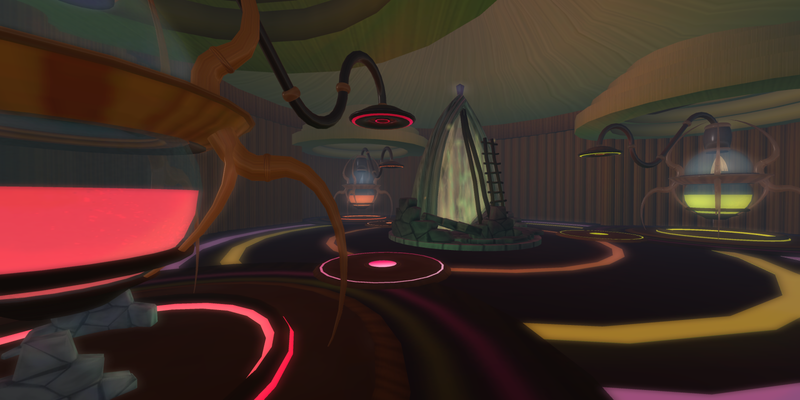 "Linden Realms is a fun, creative, and engaging virtual experience produced and provided by Linden Lab. 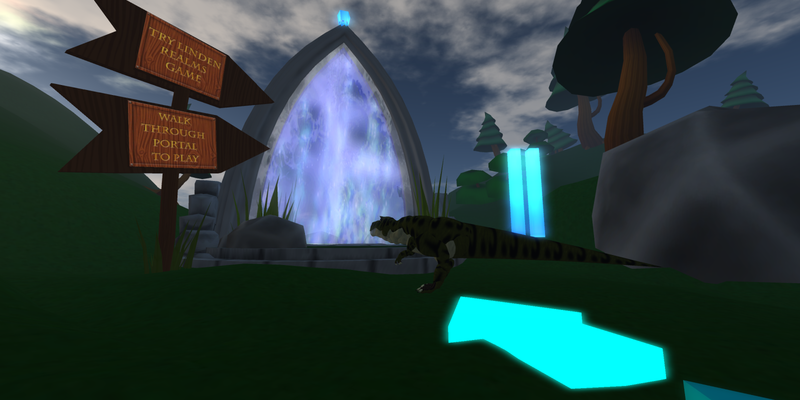 Linden Realms takes you through basic exploration and gameplay, where you can earn Linden dollars by gathering gems and completing quests" (Linden Realms Frequently Asked Questions). Linden Realms is quite lovely at times. Cartoonish compared to much of Second Life, but still not without it's own charms. The atmosphere lends itself to "fun" avatars like my baby T-Rex. After you enter the LR playing regions, a HUD automatically attaches that shows your progress in gathering crystals and also gives tasks to complete. A "?" button gives hints as to where a player (which I call a Runner) can go across several connected regions to complete a task. Runners gather crystals by simply colliding with them. The HUD shows how many crystals of each type you have gathered. In order of least-to-most rare, the crystals are Red, Yellow, Orange, Green, then Blue. Once collected, a period of time will elapse before the crystal is replaced, the more valuable ones taking the longest (ex., Green crystals take one hour while Red crystals take as little as a minute or two). Almost invariably, crystals appear in the exact same spot from where one was collected. Boulder-like "Rock Monsters" chase Runners and the latter will be "killed" if caught then teleported to a safe hub where they can continue without any real penalty. To best avoid the monsters, run at all times (double-tap the Up key on your keyboard or set Ctrl-R to always run). Other hazards include falling rocks, fireballs, and toxic rivers/ponds. Runners are discouraged from flying or using super-speed attachments by roving "clouds" that will descend from the sky and eject you from the field of play. There is a process (which I have not experienced) that will ban you from the game should you be ejected often enough. At any time you can visit special machines that will take your collected crystals in exchange for Linden dollars ($L) under the pretense of forwarding the storyline behind the game. Completing quests also earns cash. Green Crystals and Blue Crystals are worth L$1 and L$2, respectively. More often than not, the HUD won't attach. Runners can still gather crystals and cash them in, but quests won't work. 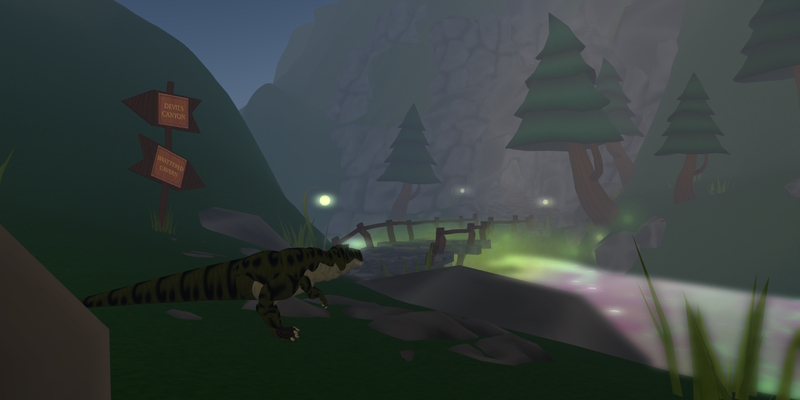 Visiting the Workshop in the main region will sometimes cause the HUD to show up while being teleported by a monster, or leaping off a mountain into the landing area can have the same effect. Going back to the Portal regions and re-entering the game regions can sometimes help. When you arrive in the game regions, you actually fall through the HUDs that are supposed to auto-attach when you arrive. You can play without them, but there are no quests. Crystals often rez inside rocks, trees, buildings, etc, so that they cannot be collected. This reduces the total number of crystals available and makes the rare ones even more rare. 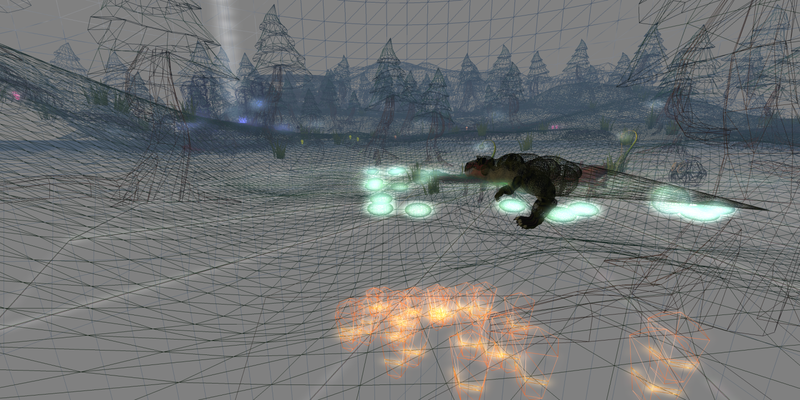 Using Wireframe View, you can see that a cluster of Orange crystals is stuck under the boulder under my avatar. These can't be collected. A cluster of five often rez near by so it's a good spot despite this problem. People cheat. It is not terribly unusual to come across "bots" that are programmed to visit locations with valuable Green or Blue crystals with regularity. That's the problem with known patterns. Since I usually go through a portal that I know takes me to a game area with a good number of Green crystals, maybe I'm cheating? An hour after it is collected, another Green crystal will appear on that exact spot. There are usually two more within a hundred meters. Three, really, but one is stuck under a plant, like the one that is blocking the Rock Monster from getting me. A valuable Blue crystal is stuck in one of those trees and can't be collected. There might be more problems. I guess that depends on one's point of view. As I said, I generally find Linden Realms to be enjoyable. Use the region's recommended Windlight settings, try different strategies, make up your own games, or run with a friend. Linden Realms has several problems, some of the problems are just annoying while other problems is making it hard or even impossible to play the game, her will I present some of the problems and give some suggestions how they may be addressed. 1). When you come to LR shall you get a hud that automatically get attached to you, but this seldom happens and new users get confused about this and without HUD there is no way for a new user to understand what they shall do. * The fix for this is to make a sign you can click on to get a new temporary hud attached. 2). When you land in the Linden Realms or get teleported within LR you can find that your legs has get stuck and can not move, this is a bug that soon may be fixed but the fix for this is to use Avatar Health to stop Animating My Avatar. * The fix here may be a sign that can give users a note card with Tips and Trick for LR. 3). Linden Realms works poorly and often are parts of the realms empty and you may not be able to find any crystals and some time are there no monsters in a sim. * The fix here is to give trust to user groups that can have a V.I.P status to request that LL restart the sim or to get the privilege to reset scripts within LR, or they need to have a dedicated Linden for only LR, I am sure some Lindens has a daughter or a son that can be handling that for free and to get experience with handling a game server from within. 4). 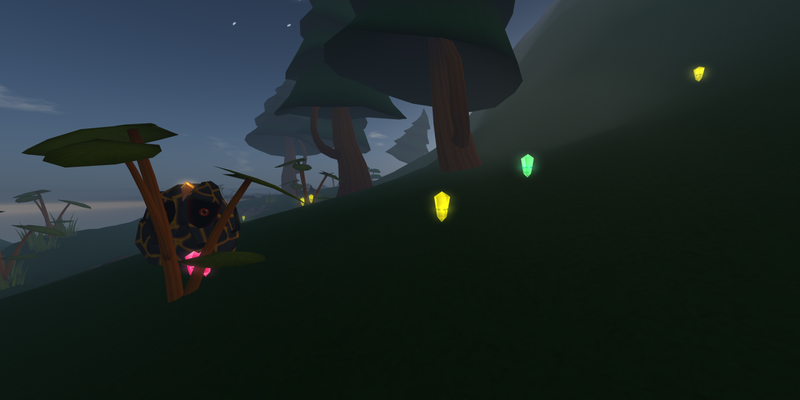 Green and Blue crystals are a important part of the games but they often get stuck in stones, trees or bushes where players never can get them, when a sim just has restarted there is a good chase that they rez so you can take them, but when a crystal has been taken it will later rez in a random spot within a given area and if there is an object in this spot that make that a player not can take this crystal it will stay there for ever. * The fix here it to have a timer in the crystals and if a crystal not has been taken within the timer cycle it will send a command to the crystal rezzer to spawn a new crystal within 1 minute and the delete it self, in this way a stuck crystal will not be stuck for ever. Cheaters: Cheaters in Linden Realm do alter the game experience for other users and it do feel a bit unfair that Linden Labs shall pay out Linden Dollar to users that do not actual 'play' the game, but we can not blame LL for this and it would even be hard for a manager to investigate if all suspected cheaters are cheater or users that constantly and without break runs in same spot 24/7. * The fix here is not easy and you has to look to the game and how it shall work and we has to set up some new rules and get new monsters. 1 – A user need to get a HUD to be able to collect crystals (See hub problem). 2 – The HUD shall give random mini quest like “Visit Tyras HQ within 5 minutes to report our findings” so users not can be in one are for longer times. 3 – LR need mud monsters that other users can use, the idea here is that the user can get a monster that follows them and then guide them towards other users, this monsters shall be easy to avoid for normal users but Bots or users that are AFK in the play area may be TP back to the portal island. 4 – More rock monsters in places where cheaters often use and use path-finding to make monsters that can patrol a larger area. Suggestion to Linden Labs to handle Linden Realms: Do not forget LR, change position of rock monster so bots not can use same area year after year, do so users has to do all task before they can collect more crystals (this will stop most one day bots), do random but easy mini quest that user has to do to not be teleported back to portal island, get a user group that can help Linden Labs to manage LR. Thanks, Hexa. I know I'm a better Runner thanks to your advice. Here's hoping the Lindens will heed you as well. If you, Dear Reader, have any thoughts or questions about Linden Realms, please add to the Comments on this post. It would be great to have a Resident dialog that could be presented to LR Linden, the Game Lord of Linden Realms.